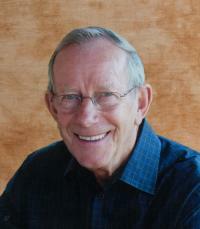 It is with heavy hearts the family of Lorne Anfindsen shares his sudden passing on Dec 21, 2012 at the age of 82 years. A stroke ended an otherwise very healthy active life. He died as he lived with dignity and honour surrounded with family and friends. Husband to Anne, his love and companion of 62 years; wonderful loving father to Cheryl Anne (Bob Keen) and Laurie (LenTreeter) and a proud grandfather of 6 grandchildren and 8 great-grandchildren. Also survived by his older sister, Edna (Bill Gadsby) of Michigan and numerous nieces and nephews. Lorne was a successful businessman, mayor of Ross Haven for 11 years, member of the Al Shamal Temple, Edmonton Shrine Motor Corp., riding in the Edmonton Klondike parade for the past 35 years, a long standing Rotarian, past President of the Edmonton Petroleum Club and many other organizations. The family will be holding a private service in honour of Lorne. In lieu of flowers, donations may be made to the Shriner Children’s Hospital.